President Macri flew to Brasilia to visit Brazil’s Bolsonaro. They found common ground on Mercosur and together repudiated Venezuela’s Nicolás Maduro. After an extended vacation in the Argentine Patagonia, President Mauricio Macri went back to work with a full agenda that included an all-important meeting with Brazil’s Jair Bolsonaro this week. Macri, who had spent two weeks out of Buenos Aires, returned to a country still battered by economic crisis ahead of a defining year for his presidency. The highlight of the week was Macri’s trip to Brasilia for what became Bolsonaro’s first official visit from a head of state on Wednesday. While the Argentine president had been criticised for missing Bolsonaro’s inauguration ceremony on January 1st, body language at the Palacio de Planalto suggested good chemistry between the two. At stake was the future of the Mercosur regional trade bloc and a response to President Nicolás Maduro of Venezuela. Another key point had to do with the position with Venezuela, which continues to endure a crippling economic and social crisis that has led to the mass emigration of some three million. President Maduro began a second term on January 10th that was largely repudiated across the region, with Macri and Bolsonaro as two of the most critical.”We reaffirm our condemnation of Maduro’s dictatorship. 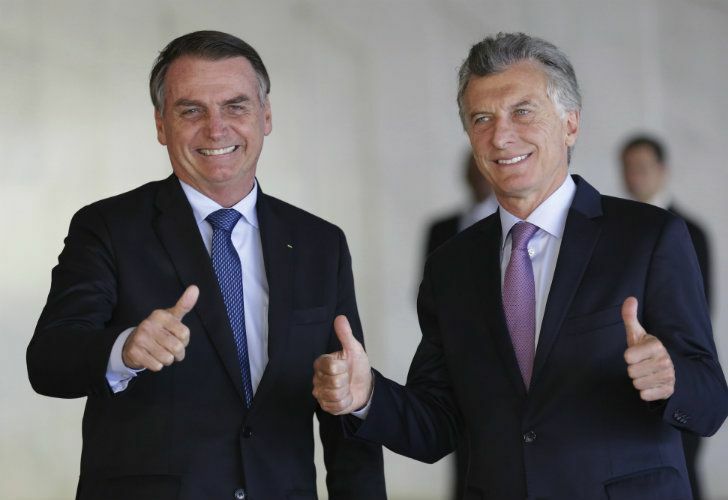 We will not accept this affront to democracy,” President Macri told reporters in Brasilia with Brazilian leader Jair Bolsonaro standing nearby. “The international community has already recognized that Maduro is a dictator who seeks to stay in power through fictitious elections, imprisoning opponents and leading Venezuelans into a desperate situation,” he said. Only a few days earlier, Bolsonaro had called Maduro a “modern-day Hitler” and declared that Brazil, like Argentina, was on the frontline of “the defence of liberty” in Latin America. Both Brazil and Argentina are part of a country grouping in the Americas that spurns Maduro’s rule and which recognises Venezuela’s largely sidelined opposition-controlled parliament as the “only legitimate institution” in the South American nation. Indeed, Macri and his Cambiemos (Let’s Change) coalition will now have to concentrate fully on this year’s electoral process, with the first election—the PASO primaries— slated for August 11. Inflation finished Macri’s third year in office at a record 47.6 percent, while the economy remains in a recessionary trend. Before dealing with his potential opponents, including former President Cristina Fernández de Kirchner, Macri and his key aides—Cabinet Chief Marcos Peña and political advisor Jaime Durán Barba—must find common ground with Buenos Aires province Governor María Eugenia Vidal. Pro party’s political wunderkind, Vidal has put together a commission analyzing the possibility of splitting provincial elections from the general elections, allowing her to differentiate herself from the President and his high levels of negative image. While Vidal remains a key ally, along with Buenos Aires City Mayor Horacio Rodríguez Larreta, the economic crisis has eroded support for Macri’s coalition while helping Fer - nández de Kirchner grow in early polls. With Bolsonaro in his corner, and more importantly, the Brazilian economy returning to growth, Macri can continue to dream with reelection.